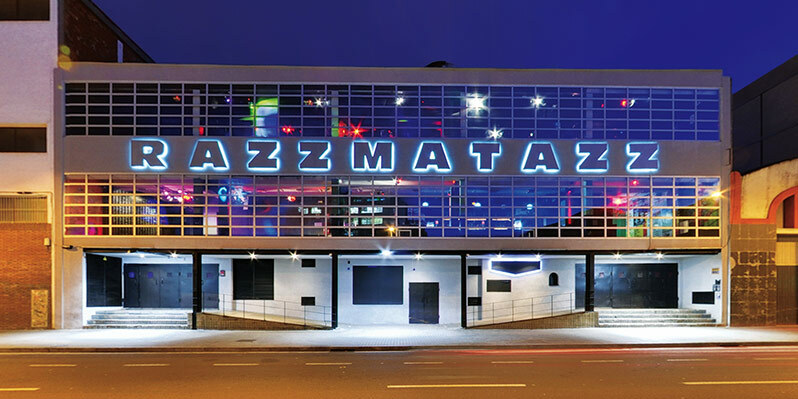 Razzmatazz is the epicentre of some of the most important events in Barcelona, a space that stands out for its multi-functionality, technical equipment, capacity, and prime location between Plaza Cataluña and the modern 22@ - forum (CCIB) area. The possibilities offered by Razzmatazz are as vast as the capacity and diversity of the room itself. Its industrial architecture with 3,700 m2 of floor space means that it can be divided into 5 independent multi-spaces with different capacities, equipped with stages, professional sound systems (live & DJs), lights and visuals. The building allows each space to have its own facilities such as bars, cloakrooms, toilets and outdoor terraces, optimising service for those present at any of its spaces. Our human team with experience in technical and artistic production, communication, HR, marketing and design will offer preferential treatment from the outset to achieve the objectives set by the client. This is an open space where you can organise all kinds of social events related to communication, incentives, music or any cultural expression. A room of over 700 m2 and 10 m high, a 120 m2 stage equipped with the latest sound systems, lights and visuals. Available with dressing rooms, toilets and showers, catering areas, production office and easy access for loading and unloading. Room 1 has two adjoining rooms with a capacity for about 175 people alternative spaces, VIP areas or smoking rooms. Both rooms are equipped with sound systems, lights, visuals, bar service, toilets and two outdoor terraces. A completely open space of 400 m2 and 6 m high with a 60 m2 stage equipped with a technical infrastructure similar to Room 1 in terms of the latest sound systems, lights and visuals. It also has areas for dressing rooms, catering, production office and forklifts. Just a few metres from Room 2 is Room 3, with a useful alternative space to expand its capacity, as a VIP or chill out area, and creating another ambiance at the same event. This is an independent space next to Room 2, ideal for private activities or small groups of up to 200 people standing or 100 seated. A 200 m2 and 4 m high space with a 30 m2 stage and complete sound system, lights and visuals. These are two of the most in-demand spaces for activities or private parties. The rooms have sofas, tables, their own toilets, bar service, DJ booth, lights and audiovisuals. Suitable rooms to customise any type of party. Razzmatazz is located 10 minutes from the CCIB (International Convention Centre of Barcelona) and the Olympic Port area and 15 minutes from the beating heart of the city, Plaza Cataluña. The venue is located in an area of 4 and 5-star hotels, including the renowned Hotel Arts.